The patellofemoral joint is a unique and complex structure consisting of static elements (bones and ligaments) and dynamic elements (neuromuscular system). The patella has a configuration of a triangle with its apex directed inferiorly. Superiorly, it articulates with the trochlea, the distal articulating surface of the femur, which are the main articulating surfaces of the patellofemoral joint. The articular cartilage of the patella is similar to that of other joints in that it contains a solid phase and a fluid phase that is mostly composed of collagen and glycosaminoglycans. The solid phase is somewhat permeable and when the articular surface is under load, the fluid gradually redistributes itself within the solid matrix. Therefore, the pressure within the fluid is strongly associated with the cushioning effect of the articular cartilage and the low friction coefficient of articular surfaces. Any damage to the articular surfaces causes a loss of pressure within the fluid phase, which subsequently results in higher stresses on the collagen fibers and more vulnerability leading to possible breakdown. The patellar retinaculum is an important stabilizer of the patellofemoral joint, mainly its medial and lateral components. 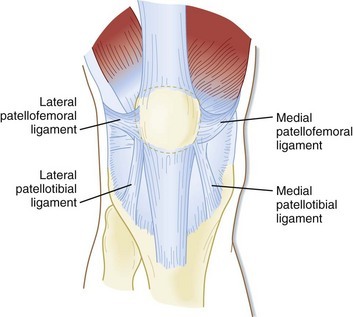 The Medial Patellofemoral Ligament (MPFL) - originates on the medial femur and has a “sail-shaped” attachment on the patella and quadriceps tendon. Because of its wider attachment than its origin, several authors have promoted the technique of using a double-bundled graft to recreate the anatomy of this complex. Kang and colleagues described two components of MPFL fibers, using the term superior-oblique bundle and inferior-straight bundle. The clinical significance of this is not yet known, but the authors suggested the bundles may vary in their roles as dynamic versus static stabilizers. Furthermore, length differences between the two bundles or attachment sites, have been described. Mochizuki and colleagues showed the length of the MPFL fibers from the origin to the medial patella was 56.3+/-5.1 mm vs. 70.7+/-4.5 mm to the quadriceps tendon. The Lateral Patellofemoral Ligament (LPFL) - is an important lateral stabilizer of the patella against medial subluxation or dislocation. Some authors describe the lateral patellofemoral ligament as a palpable thickening of the joint capsule between the patella and femoral epicondyle. Medial movement of the patella is controlled by the vastus medialis oblique (VMO) muscle. Lateral tracking is guided by both the vastus lateralis and the iliotibial band. Patellar motion is further constrained by the patellofemoral ligament, the patellotibial ligament, and the retinaculum. The patella lies within the quadriceps tendon and thereby increases the mechanical advantage of the quadriceps mechanism. Not only does the patella increase the force of knee extension by 50%, but it also provides stability to the patellar tendon and minimizes the forces placed on the femoral condyles. Tracking of the patella begins with the lower patellar border lying in contact with the suprapatellar fat pad when the knee is fully extended. With knee flexion, the patella moves proximally with a lateral shift. During normal patellar tracking, the patella engages in the trochlea at around 30° of knee flexion and remains stable then after due to the bony constraints of the trochlea. As the knee continues to flex, the tibia internally rotates and the patella moves upward. The patella is engaged with the trochlea at 20-30º of knee flexion. At 90º the patella contacts the lateral and medial femoral facets within the condylar fossa. At 130-135 º of knee flexion, the medial facets of the patella contact the articulating surface of the femoral condyles. observation of the position of the patella with the knee in 90° of flexion: patella alta, patella baja, or patellar lateralization may be present. observation of patellar tracking in terminal extension (30-0°): a J-curve may be present. assess the patellar glide: a tight lateral retinaculum can decrease the medial glide; a medial glide of less than 5 mm (1 quadrant) can indicate a tight retinaculum. If a positive apprehension sign (fear of the patella popping out of position) is elicited with assessment of the patellar glide, suspect a patella subluxation or dislocation. palpate the pain: tenderness is often found on the patellar facets, the trochlea, and the peripatellar soft tissue. Tenderness to palpation at the superior or inferior poles of the patella usually indicates another pathology. assess the patella compression test. Compress and push the affected patella distally. Pain is a positive test associated with anterior knee pain. An active test, in which the patient contracts the quadriceps tendon against a compressed patella, has a high false-positive rate. assess the Q-angle. The Q-angle is the angle formed by a line created from the ASIS to the mid patella intersecting with a line created from the mid patella to the tibial tubercle with the knee in full extension. The average Q-angle for males is 14°, and the average for females is 17°. An increase in this angle can indicate abnormal patellar tracking. A 2-year follow-up of isolated Medial Patellofemoral Ligament Reconstruction by using soft suture anchor and adjustable cortical fixation system. Intraoperative fluoroscopy during MPFL reconstruction improves the accuracy of the femoral tunnel position. ↑ 1.0 1.1 1.2 Kim Y-M, Joo Y-B. Patellofemoral Osteoarthritis. Knee Surgery Related Research. 2012;24(4):193-200. doi:10.5792/ksrr.2012.24.4.193. ↑ 2.0 2.1 2.2 2.3 2.4 2.5 Medscape. Drugs and Diseases. Patellofemoral Joint Syndromes. Available at: http://emedicine.medscape.com/article/90286-overview#showall (accessed 08 august 2016). ↑ NAVARRO, Marcelo Schmidt et al. Relationship between the lateral patellofemoral ligament and the width of the lateral patellar facet. Acta ortop. bras. [online]. 2010, vol.18, n.1, pp.19-22. ISSN 1413-7852. ↑ Healio MedBlog. Orthopedics. Business of Orthopedics. BLOG: Update on medial patelofemoral anatomy, implications for reconstruction. Available at: http://www.healio.com/orthopedics/business-of-orthopedics/news/blogs/%7B556829f5-0f97-42a6-9c3f-4f6ffe7aa48e%7D/patellofemoral-update/blog-update-on-medial-patellofemoral-anatomy-implications-for-reconstruction (accesed 10 august 2016). ↑ Roy Wung. Patellofemoral joint motion and patellar tracking. Available from: https://www.youtube.com/watch?v=Q-80Qi5cx9o (accessed 27 august 2016). ↑ Healio MedBlog. Orthopedics. Business of Orthopedics. Patella alta, Patellar instability: Complex interplay between patellar height, instability and other risk factors. Available at: http://www.healio.com/orthopedics/business-of-orthopedics/news/blogs/%7B9009ff33-26ef-4f48-8b75-1231b566877e%7D/patellofemoral-update/patella-alta-patellar-instability-complex-interplay-between-patellar-height-instability-and-other-risk-factors (accessed 10 august 2016). ↑ Jason Craig. Examination of the Patellofemoral Joint - Palpation. Available from: https://www.youtube.com/watch?v=LgBNuWQMSC8 (accessed 27 august 2016). ↑ Jason Craig. 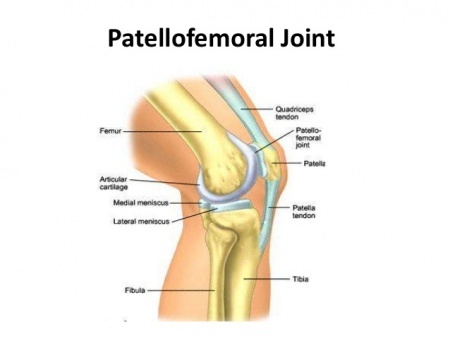 Patellofemoral Joint Examination - Observations. Available from: https://www.youtube.com/watch?v=we9COmZ-cig (accessed 27 august 2016). ↑ Jason Craig. Patellofemoral Joint Examination - Observations in Sitting. Available from: https://www.youtube.com/watch?v=gmt5hiYlyDQ (accessed 27 august 2016).